888poker’s XL Championship series returns for another go-around from January 18-28. Offering over $2.9 million in guaranteed money and a new, sleeker streamlined selection of tournaments, XL Blizzard is offering tournament players a winter series that sure to create massive prize pools while at the same time offering new promotions to entice players to find their way into as many tournaments as they can. XL Blizzard is the end of the XL Championship trilogy as announced by 888poker back in April. While previous iterations of the XL Series bombarded players with massive schedules, testing their tournament fortitude, the upcoming XL Blizzard has paired down its offerings to a healthy 34 events, affording players with an appetite for guaranteed prize pools the time to hop into every event they wish. While every event carries a guarantee worth playing for, highlighted events of the 11-day affair include the $80,000 Opening Event, a full day of 888poker’s trademark “Crazy 8” tournaments, a $2,100 $250,000 guaranteed High Roller as well as the $1,000,000 Main Event for which there are multiple satellites helping feed players into the big-money event. Sure, there may be fewer events during XL Blizzard than previous XL series’, but 888poker is packing it full of promotions for tournament and leaderboard winners and even those who feel the sting of going out on the bubble. Winning one tournament in any given series is tough enough, winning two puts a player in an exclusive club and three, well, that might mark the heater of a lifetime. But if somehow, someway a player is about to find their way to five victories over the 34 event series, not only will they achieve instant online legend status but 888poker will also make them a millionaire. 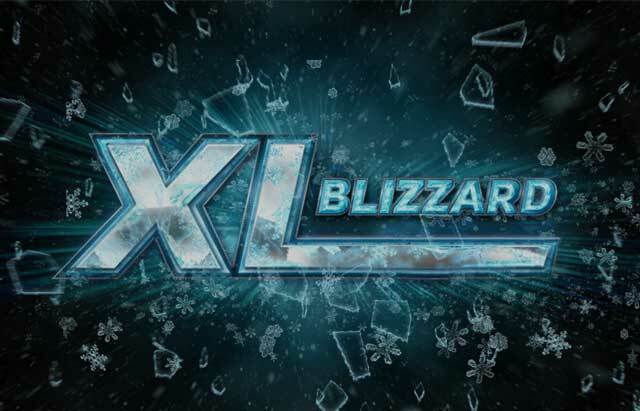 The XL Blizzard $1,000,000 Winners promotion will pay cold hard cash to those players who win multiple titles. Win two events, win an extra $1,000. Win three and they’ll make it $10,000. Four victories is a bonus $100,000 and five or more puts seven-figures in your bank account, paying $1,000,000. The bonuses don’t stop with winning multiple titles. Players who make three or more final tables in the XL Blizzard series will receive a $600 tournament ticket. Similarly, if a player cashes in eight or more of the 34 events, 888poker will gift them a $215 tournament ticket. Players who finish in the Top 50 of the series tournament leaderboard will get an additional opportunity for even more prizes. The Top 50 will be entered into the XL Blizzard Champion of Champions event, the winner of which will receive an exclusive package putting them into the $10,000 Main Event of the World Series of Poker in Las Vegas in July including travel expenses, a stay at the Vdara hotel and an 888Live poker kit. Beyond first place, the runner-up will also get a WSOP prize in the form of a $3,000 Crazy 8 WSOP package as well as a $1,050 tournament ticket. Third place also gets the $3,000 WSOP Crazy 8 package. Fourth and fifth get a $1,050 tournament ticket, and the rest of the final table receive a $600 tournament ticket. In fact, 10th-40th place will be getting a free $55 tournament ticket. For those 41st-50th, well, someone has to go home empty-handed. Finally, for those players who bear the burden of being the last person in the tournament not to make any money, during XL Blizzard, 888poker is offering a shot at redemption. The “Bubble of Bubbles” offers free entry to players who bubble any of the 34 events. The winner of the “Bubble of Bubbles” event will win one of those $3,000 Crazy 8 WSOP packages, second thru fourth take home a $160 tournament ticket while the rest of the final table pick up a $55 tournament ticket. Players can also expect plenty of 888poker pros to be logging on to defend their home turf. 888poker ambassadors including Chris Moorman, Dominik Nitsche, Parker ‘tonkaaaa’ Talbot, Natalie Hof, Sofia Lovgren and more will all be in the mix. Satellites a running for a variety of the events and players can get started working their way up through the steps for as little as a penny.